Hi there, Loves. Today I wanted to share with you all a little skincare journey I went on for 28 days with Olay. We all know Olay has been around for so long and to be honest, it was one of those products I looked at like "hmm that's for older women". 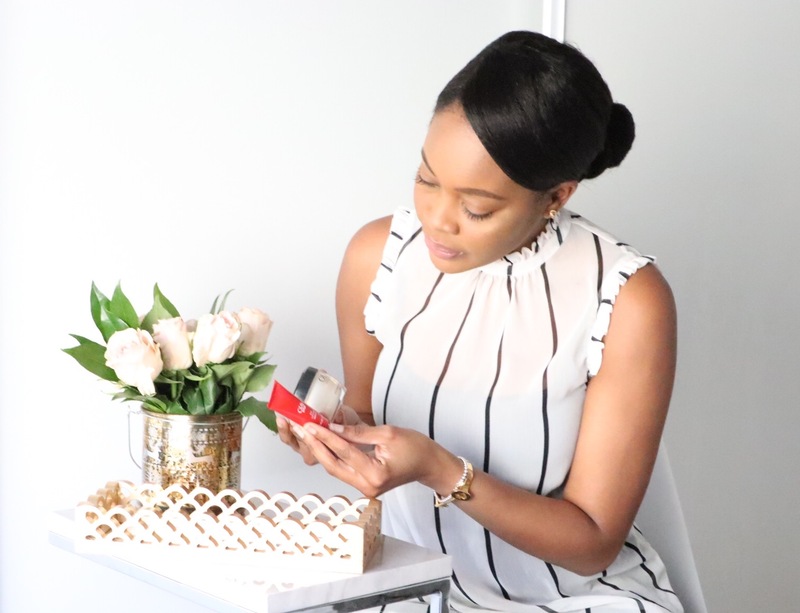 Well, I stand corrected and I am here today to share what I learned about my skin by consistently using Olay Eyes Eye Lifting Serum and the Olay Total Effects Night Firming Treatment Cream. What's cool was that I used the Olay Skin Advisor Tool too help me to select products for my problem areas. I simply used my cell phone and captured my face on the platform and it recommended the products I mentioned above. The tool was spot on about needing an eye lifting serum because I do have deepen under eye area. It's probably my most insecure feature on my face. I figured well, it was so spot about about my eyes, I will listen that I should try their night firming cream. Here's a shot of me on day one when I decided to begin using both products. My nigh time routine is very intense because that is usually the time I am removing the most impurity from my skin. I'll use cleansing cloth or make-up remover to remove most of my make up from the day. Then I use an exfoliating face brush along with a deep cleansing wash to remove the rest of my make-up and give a good cleanse. I then added the Night Firming Treatment Cream after my toner and it is so silky with little to no scent. I am particular to unscented products especially for my night time routine. Here's my thought during/after 28 day usage: I can't say my face looked 'firmer" but I can say it felt a lot more supple. A good mixture of soft and firm. It was more in the feeling than the look where I noticed a difference. I came to this conclusion about 18 days in. I finish off with the Eye Firming Cream by going around my lower eye area and massaging upwards. You never want to apply downwards or be too aggressive under your eye area. Here's my thought during/after 28 days of usage: About 2 weeks into using it, I saw a difference. It definitely was not the type of difference you get from cosmetic surgery but enough to make me a bit giddy. I was laying down playing around with my phone and taking selfies and noticed my selfie looked different in my eye area. I then said to my guy, "look babe, my eye area is improving". I've used many eye creams before and I love using multiple products, so I think this one will always be in my beauty cabinet as one of my go to eye creams from here on out. So, my conclusion with this trial is that it was totally worth it and I am so happy because after the first week when I couldn't quite tell a difference, I was ready to give up. I am glad I stuck it out and have found two other products I can go to for my skin care needs and you can too. You can get them online here at Walmart and see other products. I do recommend you take the skin care quiz to be matched with Olay products for your problem areas. Do any you use Olay or are you excited to try them out? if you do decide, come back and let me know. I am curious to know if we share the same problem areas and or results-whatever it is. Have a great rest of week darlings. I am 2000% Olay fan! Their regenerist serum is the best! I will check this product out too! I need to get better at this for sure!! Olay has amazing products even though I haven't used them in a while. I need to get back to my skin care routine for sure! Thanks for sharing! Gorgeous in every pic and your skin looks amazing! As usual you look absolutely gorgeous! I definitely need to try this eye cream!! Hello my friend! You look beautiful as always! My mom actually uses this! It works wonders! I love how you talk about the best beauty products out there! Thank you for sharing! When I think of old people brands I think of Ponds because that's what my grandmother always used! I've never thought of Olay that way and I dont know why but I've never used there products! I'm pretty good about skin care but when it comes to my eyes I feel like I always skip over the stuff specifically for them and I will certainly be checking out their eye cream so thanks for sharing! I've tried Olay products and sent my mother in law some and she and I really love it! They have the best eye serums and creams. I'm such a fan of their products! Olay is an amazing product. I have never tried it but surely gonna try it. Right now i am using lifecell all-in-one anti aging cream I absolutely love this cream, it actually is a face lift in a tube with added extras. It improved every aspect of my skin: texture, radiance and appearance. Friends have commented how my skin looks glowing and younger. Products that contain gentle, non-irritating compounds that reduce the appearance of wrinkles, along with a wide range of vitamins, antioxidants, and skin-plumping substances are ideal choices. When its comes to your skin then you should, use good products for that. In now days I'm using Revitol Anti-Aging Moisturizing Cream, this cream is really very good. Thanks for sharing such an informative post.